I found this recipe some years ago: it lives in my special hand written cake book- the one that is devoted to cakes that really work. It is my favourite cake recipe and gets adapted according to the season. The lack of a pastry base makes it so easy and quick to prepare. The original recipe calls for pears, but I am substituting apricots. Ripe peaches and nectarines work quite well too. I am yet to try it with cherries. The apricots are in season, and I must be quick before Mr Tranquillo and the visiting humanoid fruit bats eat the lot! 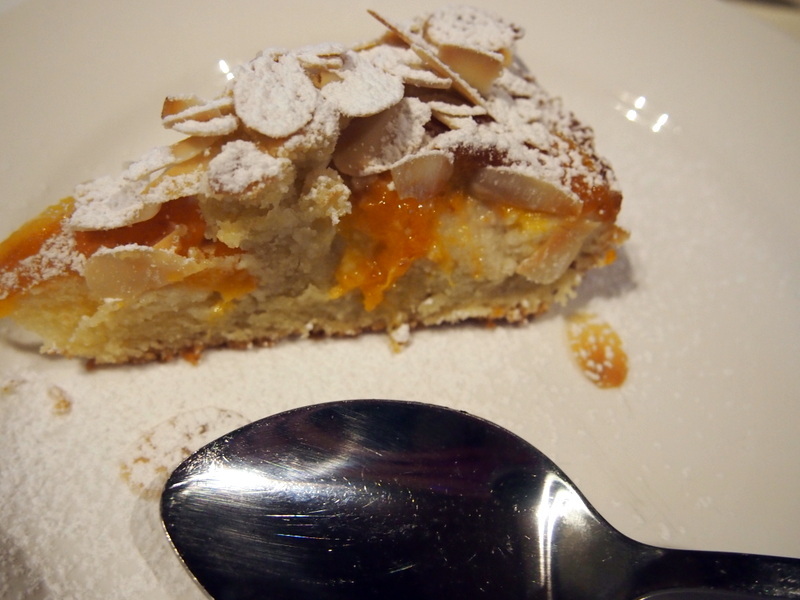 Italian Almond and Apricot Cake with Amaretto. Preheat oven to 180c /160c FF. Grease and line a 25 cm loose bottom tin. 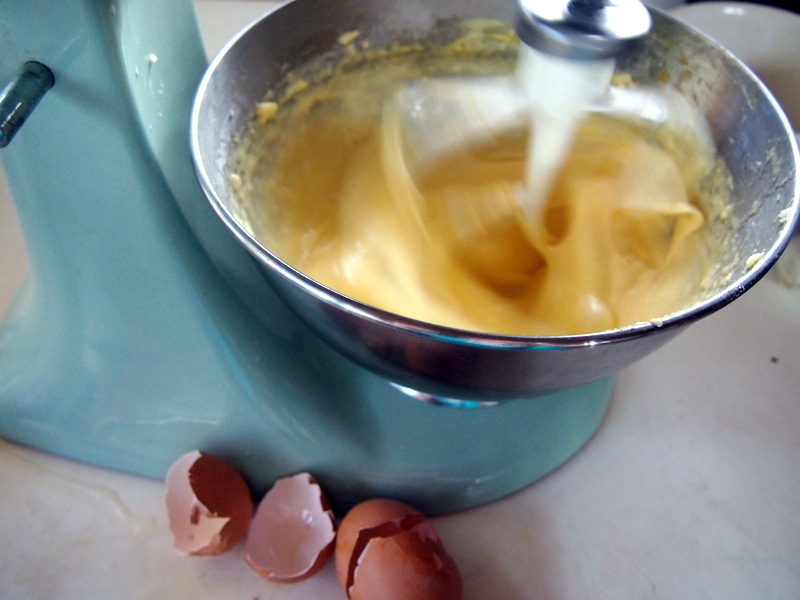 Place butter and sugar and eggs in a stand mixing bowl and beat for 5 minutes until thick and pale. Arrange halved apricot over the top and lightly press down so they are submerged. 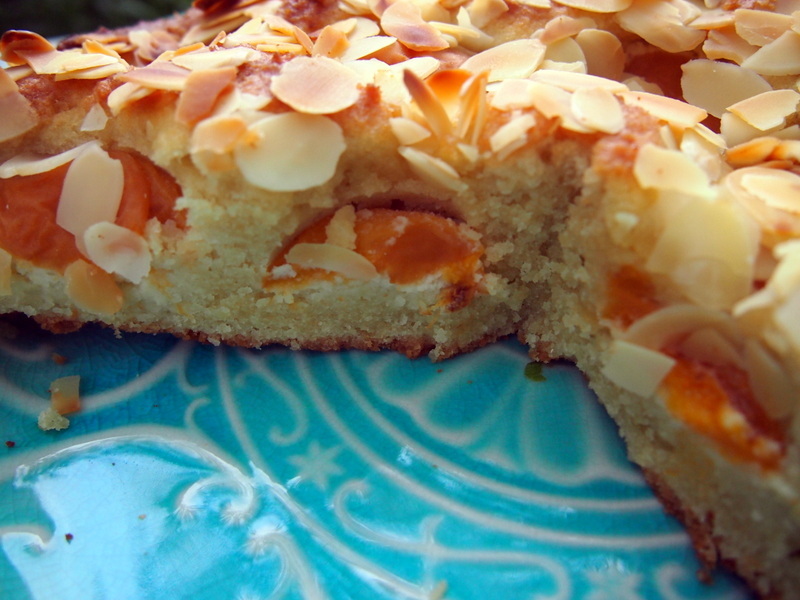 Scatter the top with the flaked almonds. Cool, dust with icing sugar. Serve with a small glass of Amaretto. This keeps well in the fridge for a few days. Re- warm slices briefly in microwave. It’s better with pears as they seem to stay beneath the filling and pears go so well with Amaretto. That is good to know…thanks. Thank you for sharing your favorite cake recipe. It looks and sounds absolutely divine, and I cannot wait to try it!! Grazie mille. Looks so incredibly delicious, and I love the pictures! This….looks like what I would like to make for sure. Delicious! Also really good with pears. I suspect those doorknobs are sold all around Europe! This looks like a keeper! I like to make a similar cake with rhubarb (that I freeze fresh from the garden for winter delicacies) and orange zest. Sounds like a lovely cake recipe. Thanks for sharing oh and for liking my post also. Ciao! Does this cake freeze well ? H Lynne, I am not sure as I haven’t tried. and i really love that photo of the recipe book — whiffs of a bygone era. It is really easy Debbie, and such a favourite with all those who have made it. Worth keeping a bottle of Amaretto around- you could just pour it over some good vanilla icecream and cheat. It is the most popular recipe on my blog in three years. Everyone who makes it seems to like it a lot. YUM! I sent this recipe to my two favorite bakers and asked for this for Christmas!! Thanks for the “like” on my blog! I hope they make it for you. Thanks Mary. Try it in apricot season. Hello! 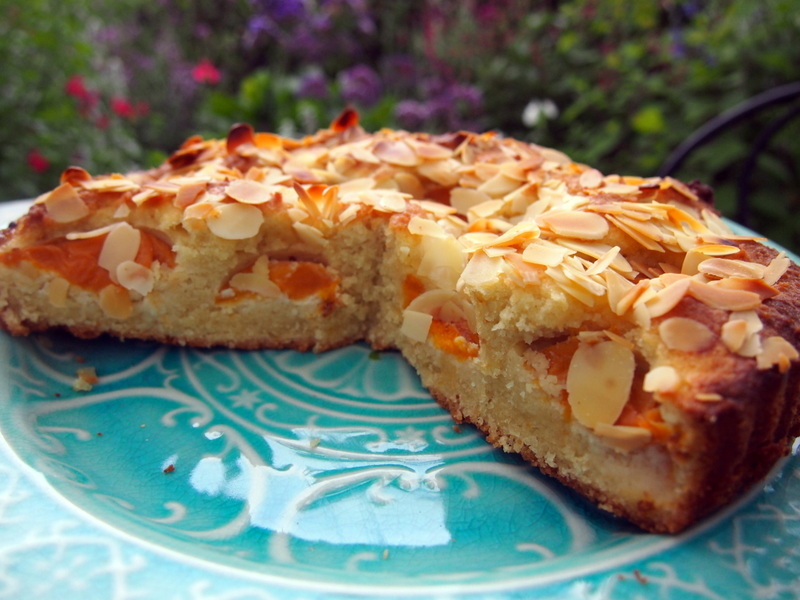 I made this cake this past summer when apricots were in season. I was so afraid that the abundant filling wouldn’t bake properly and sink or worse, be half-raw but it turned out beautifully!!! It was delicious! 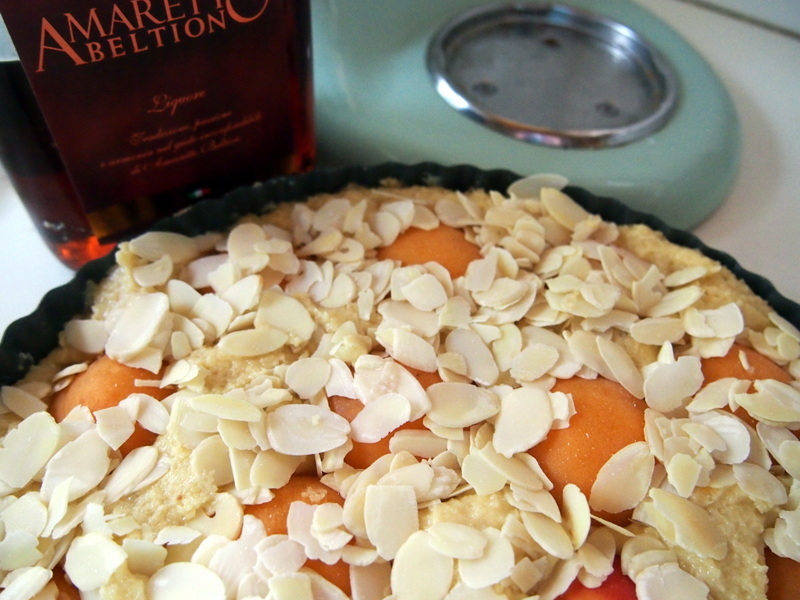 Loved the tang of the apricots against the sweet frangipane. Since I live alone, I froze about half of it. Thawed it out at room temperature. 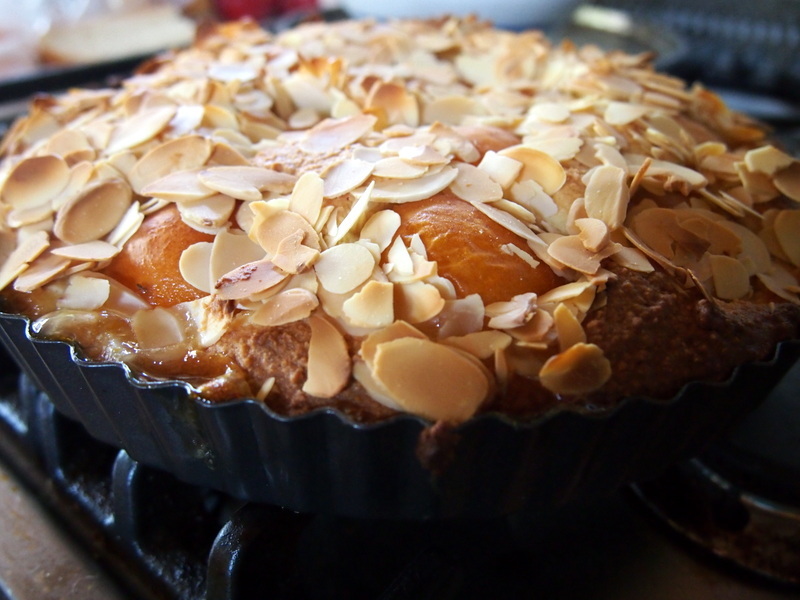 The frangipane was fine but the apricots had a weird aftertaste. My suggestion would be to make this without the apricots if you want to freeze it. I’m tempted to make it again with pears now that they’re in season. Thanks so much for this delicious recipe!! Hi Margaret. Glad you enjoyed it. I have never frozen this, though I find it keeps quite well in the fridge for a week. Usually if I have too much cake, I give one half to someone else. I often find frozen cakes disappointing. The pear version is fantastic, as is the cherry version, both somewhere on my blog. Happy Baking.